WIP of My Slow Shello Muffler .. Frankly, I am not very good in designing a pattern. 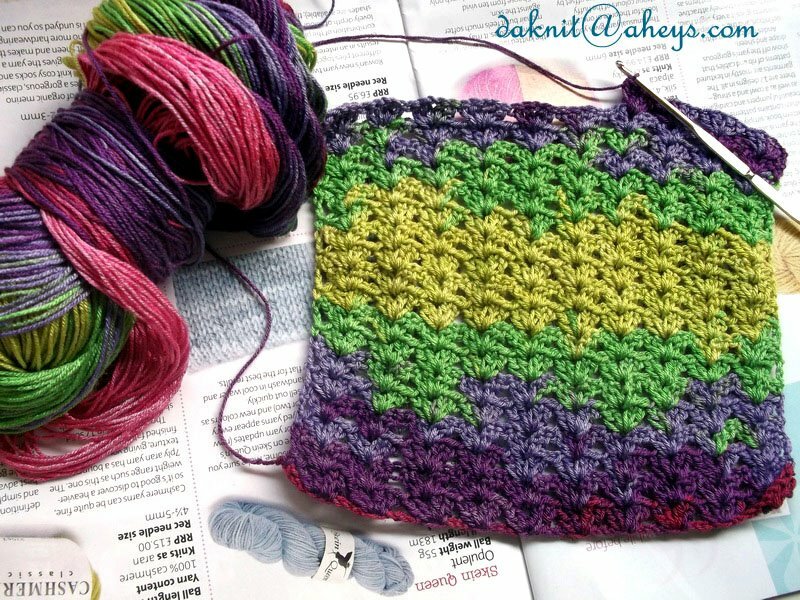 Refering to books and free patterns are always the best way to learn something new, especially when you try to create your own masterpiece… Thus, whenever you came up with an idea, it is always the best to start with the basic, and definitely goes same when it comes to crochet. After quite awhile I leave my hook and needles aside.. this is my second attempt of making something new, but yet, something basic. This Shello Muffler I called, looks complicated but yet very easy when you start making it :). I come up with and idea of making a muffler after I watched my hubby helping me untangled this yarn for few hours.. ahh.. thank you so much, canim! If not because of him, I would already cut the yarn in the middle and leave the others 😛 so wasting aren’t I? My bad habit! Thank you for hopping by to da’knit! May Allah swt bless us all. Alhamdulillah.. that finally I received my yarns again from Turkey after long wait, This time after seeing my friends from YLM having this beautiful yarns, I could not resist to try them out too. 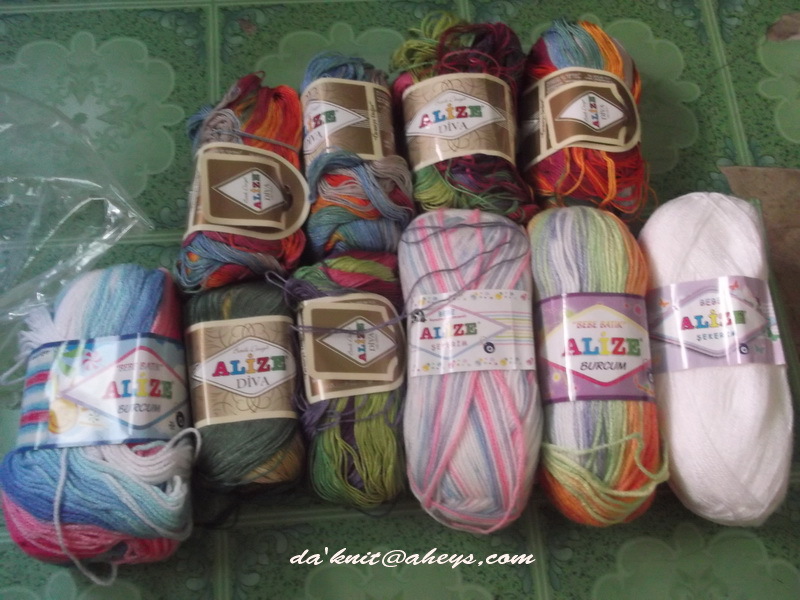 So I contact with a friend, Belgin, my Turkish friend and bought this from her 🙂 10 balls of Alize yarns… they are burcum, sekerim(syekerim), diva, batik, burcum bebe batik. Ohhh… the thing is, I am not sure if i will ever start a project using these yarns. Seems for now, going to keep this as one of my colletion. Enough with the new yarns.. Just now i received an email asking about how to make a mittenn and socks. 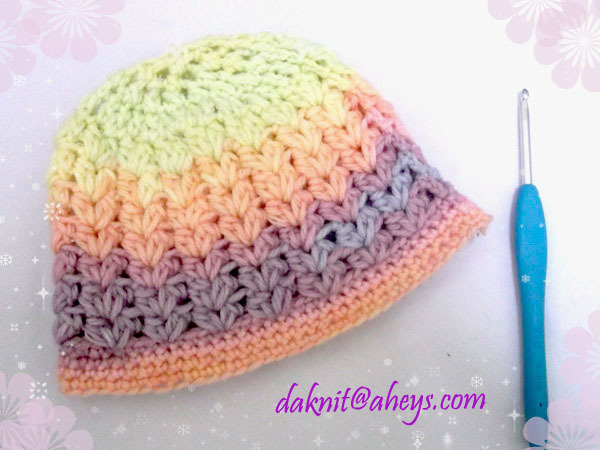 InsyaAllah, I will try to provide a tutorial in time but I could not promise when.Honestly, it’s been a month I haven’t touch my knitting needles and hook. But two days ago, I started a new project again and hopefully I can complete it soon. Really having a very slow knit and cro. Thank you again for hopping by and drop by in Da’Knit. InsyaAllah when i’m feeling much better, will try to update more in the future again as before. May Allah swt always be with us, dunya ve akhirat. Amin.. Please look at the very bottom of the chart. On the left side are three symbols. These are the ones most commonly used, and if you learn only these three, plus the one at the very top of the back armhole, just under the shoulder slope, which somewhat resembles a T, you will usually be able to knit from a Japanese chart. The symbol for rows is the first one at lower left. It resembles a capital F, with two extra arms, coupled to a symbol that often looks like an R over an x. The stitch symbol looks like a ladder, and the times symbol looks like a box with a dot in it. At the lower right is a notation that 10 cm = 31 sts, 52 rows. For knitters who use the metric system, please ignore this paragraph; you do not need to convert to inches. As stated earlier, 10 cm is almost 4″. Actually it is just a hair over 3.9″ Most of the time, simply dividing by 4 will give you results close enough. 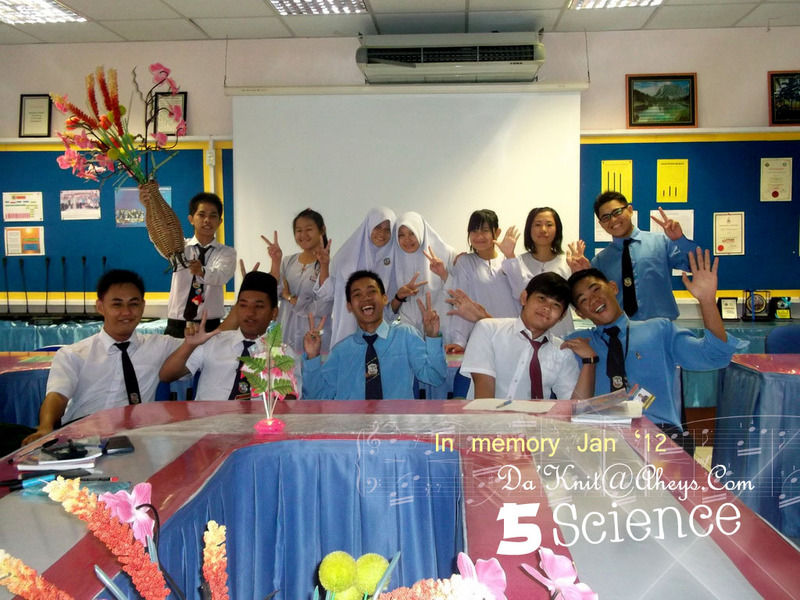 That is what we are going to do in this instance. 31 divided by 4 equals 7.75 stitches per inch. 52 divided by 4 equals 13 rows per inch. It might not be possible to match this gauge. We will not tackle the issue of recharting for a different yarn right now. The focus of this lesson is just to learn to read the chart. Looking at the photo, the yarn appears to be similar to Tamm Diamante, in other words a hard finish yarn, not a soft, fuzzy one. We will begin with the Back. The dotted vertical line means that this is half a pattern; it is similar to marks on the center back of a sewing pattern which indicate it should be placed on a fold of the fabric. The line at the bottom, extending out past the center vertical means that the entire garment width is 42 cm, or 130 sts. The number 1 plus the ladder (stitch symbol) in the band indicate that it should be done in 1×1 ribbing. You are expected to know that ribbing is worked at a tighter tension than Stockinette. In the middle of the Back, the large characters mean “Back” and the smaller ones under them mean “Stockinette”. Usually you will be able to determine this just from looking at the schematic, and at the photo of the garment. So, when knitting this pattern, we cast on 130 sts at tension appropriate for ribbing, which is usually 2 full numbers less than Stockinette tension. Knit even 39 rows, as shown in the vertical space between Back and Front at the band length. Since there are arrowheads at each lengthwise section, we are supposed to turn the row counter back to 000. 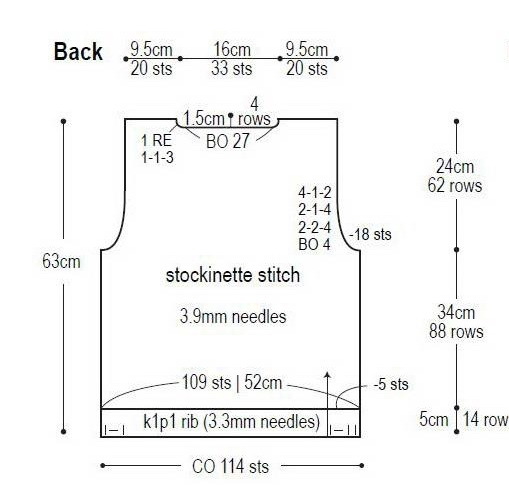 Change to Stockinette, knit even to armhole, RC 76, and reset the row counter to 000, as indicated by the arrowheads. This completes the armhole shaping. The -23 plus the stitch symbol at lower armhole means that a total of 23 stitches should have been decreased from each armhole edge. If we total all of the stitches in steps 1-5 above, we see that this is indeed the case. As further reference, look at the very top of the chart. The line indicating back width shows 27 cm, and 84 stitches remaining. 130 stitches, the amount at the cast on edge, less 46 sts (23 from each armhole) equals 84 stitches. Now, looking at the armhole length line between Back and Front sections, we see that there are 106 rows between base of armhole and beginning of shoulder shaping. Therefore, knit even to RC 106. In this pattern there are 8 rows for neck shaping, and 8 rows for shoulder shaping. This is shown at the top on the pattern. Numbers at center back line indicate neck depth, and numbers between Back and Front indicate shoulder depth. The neck shaping figures are located inside the Back outline, and the shoulder shaping figures are outside. This is one time I would likely make a “cheat sheet” or T-Bar before knitting, since this involves some fairly complicated shaping. First reset the row counter to 000, as indicated by the arrowheads. We will assume that the carriage is on the right. The line directly above the schematic indicates that there are 13 sts in each shoulder, and 58 sts in the neck. The numeral 44 plus the stitch sign at top of center back line indicates that there are 44 stitches in center back neck. 7 stitches are in the neck shaping on each side. We will assume that the neck and shoulders are shaped by placing stitches into hold position. RC 008. The funny “T” symbol indicates that shaping is completed at the neck edge, and to knit 2 rows even. Therefore, just Knit 1 row to the left, and DO NOT wrap. 3 sts remain in work position at the shoulder, as indicated by the 3, plus the stitch symbol in parentheses. Push the 10 HP shoulder stitches back about halfway on the bed (upper work position), Knit 1 row over all 13 shoulder stitches, and remove on waste yarn. Return left side to work pos and knit to correspond, reversing the shaping. When shoulder is completed, Knit 1 row main color across back neck sts, then remove on waste yarn. Front is made similarly. A large intarsia pattern begins 31 rows above the waistband, as indicated by the line across the lower Front, and the row symbol plus numeral 31 on the right side. We will do the armhole shaping, exactly as it is charted. Please note that the same shaping must be worked on both sides. This shaping makes the front armhole narrow in faster than the back armhole. Now comes the trickiest part of the whole pattern. We must knit even to the neck edge. However, the row count number for this is not given. We must determine it mathematically. On the left side, the chart indicates there are 36 rows in the neck shaping. 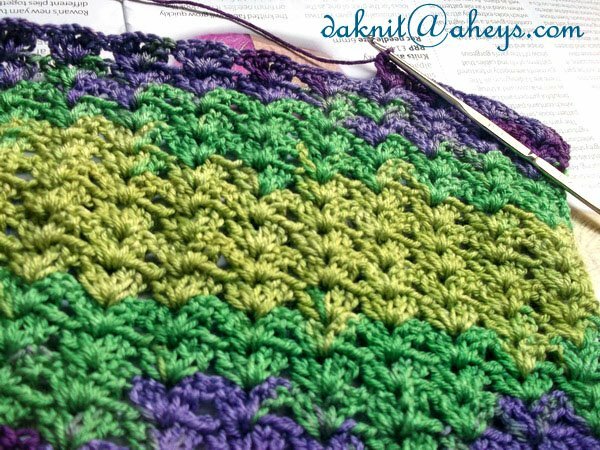 There are 106 rows for the armhole, plus an additional 8 rows for the shoulder shaping. 106 plus 8 equal 114 rows for total length above armhole. 114 minus 36 equal 78. Therefore we begin the front neck shaping on RC 78. Front shaping will be a little simpler than the Back, since neck shaping ends before shoulder shaping begins. We know this beacuse the final shaping note at the front neck edge is the numeral 18 plus the funny “T”, idicating 18 rows even after the last shaping row. Since there are 8 rows in the shoulder, there will be 10 rows even, with no shaping, between last neck decrease and first shoulder decrease. We will now write out the actual pattern.